Offset (ET) of a wheel means the distance between the rim centre and the inner contact plane between the rim and the hub (or brake drum), measured in millimetres. 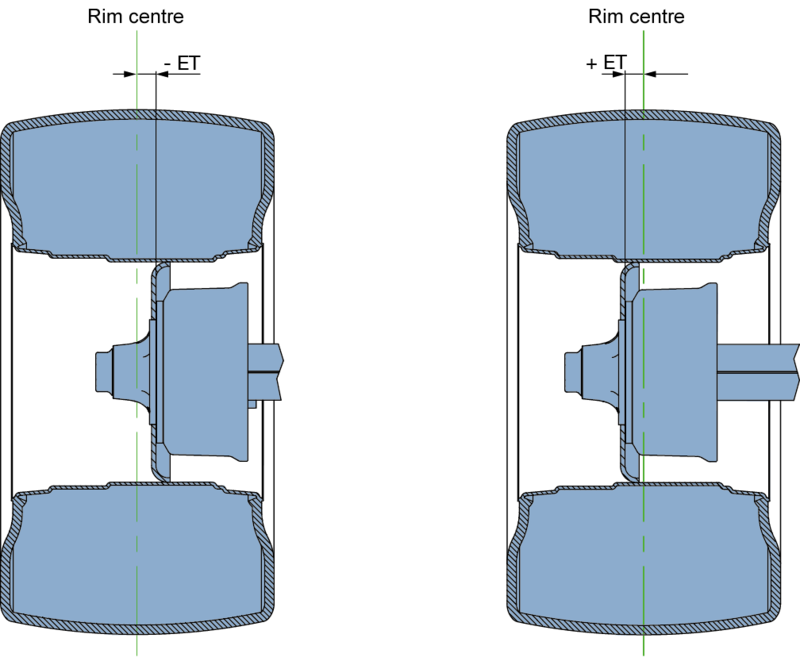 A zero offset means that the centre of tyre running surface is symmetric with respect to the mounting plane between the rim and the hub (or brake drum). A positive offset (e.g. + 25 mm) means that the contact plane is displaced outwards in respect to the rim centre. As a result, the track (SP) is reduced. A negative offset (e.g. – 25 mm) means that the contact plane (rim flange) is displaced inwards. As a result, the track is enlarged. BPW agricultural axles are usually designed for the application of rims with a zero offset. Rims with offset (positive or negative) have a different wheel pressure line resulting in higher load on the respective wheel bearing (positive offset – inner bearing, negative offset – outer bearing). In certain circumstances this may reduce axle load.